Hand crafted, this artisan toilet, exclusively from The Remarkable Toilet Company (TRTC) is available in a number of metallic finishes including bronze, copper and gold. Priced at only £1150 this stunning blue speckle close coupled toilet pan is available exclusively from The Remarkable Toilet Company (TRTC). 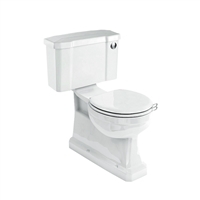 Add some Art Deco style to any bathroom or WC with this beautiful close coupled toilet. Priced at only £850 this stunning blue and white floral close coupled toilet pan, available exclusively from The Remarkable Toilet Company (TRTC), is the only truly faithful reproduction of a Victorian decorative porcelain toilet available anywhere. Priced at only £850 this stunning multicoloured floral close coupled toilet pan, available exclusively from The Remarkable Toilet Company (TRTC), is the only truly faithful reproduction of a Victorian decorative porcelain toilet available anywhere. Priced at only £800 this stunning Satin Black close coupled toilet is available exclusively from The Remarkable Toilet Company (TRTC). The Britton Cube S20 Close Coupled WC with One Piece Cistern & Soft Close Seat from Britton offers exquisitely crafted ceramic pieces with ultra slim edges to create a unique designer feel. 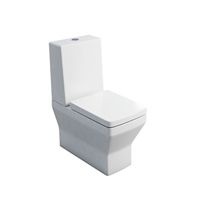 The Britton Cube S20 Close Coupled WC with Angled Lid Cistern & Soft Close Seat from Britton offers exquisitely crafted ceramic pieces with ultra slim edges to create a unique designer feel. 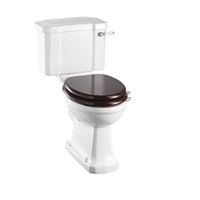 The Britton Cube S20 Close Coupled WC with Standard Lid Cistern & Soft Close Seat from Britton offers exquisitely crafted ceramic pieces with ultra slim edges to create a unique designer feel. The Burlington S-Trap Close Coupled WC with Slimline Push Button Cistern has a traditional appearance, lovingly crafted and hand finished with exceptional care using the finest materials and manufacturing processes. The Burlington Regal Close Coupled Pan with Slimline Push Button Cistern has a traditional appearance, lovingly crafted and hand finished with exceptional care using the finest materials and manufacturing processes. The Burlington Regal Close Coupled Pan with Push Button Cistern has a traditional appearance, lovingly crafted and hand finished with exceptional care using the finest materials and manufacturing processes. The Burlington S-Trap Close Coupled WC with Push Button Cistern has a traditional appearance, lovingly crafted and hand finished with exceptional care using the finest materials and manufacturing processes. The Burlington S-Trap Close Coupled WC with Lever Cistern has a traditional appearance, lovingly crafted and hand finished with exceptional care using the finest materials and manufacturing processes. The Burlington Slimline Close-Coupled S-Trap Toilet has a traditional appearance, lovingly crafted and hand finished with exceptional care using the finest materials and manufacturing processes. The Burlington Regal Close Coupled Pan with Slimline Lever Cistern has a traditional appearance, lovingly crafted and hand finished with exceptional care using the finest materials and manufacturing processes. The Burlington Regal Close Coupled Pan with Standard Lever Cistern has a traditional appearance, lovingly crafted and hand finished with exceptional care using the finest materials and manufacturing processes. The Burlington Standard Close Coupled Pan with Slimline Push Button Cistern has a traditional appearance, lovingly crafted and hand finished with exceptional care using the finest materials and manufacturing processes. The Burlington Standard Close Coupled Pan with Push Button Cistern has a traditional appearance, lovingly crafted and hand finished with exceptional care using the finest materials and manufacturing processes. The Burlington Standard Close Coupled Pan with Slimline Lever Cistern has a traditional appearance, lovingly crafted and hand finished with exceptional care using the finest materials and manufacturing processes. The Burlington Standard Close Coupled Pan with Lever Cistern has a traditional appearance, lovingly crafted and hand finished with exceptional care using the finest materials and manufacturing processes.